Warsaw is a unique city. It is said that it "survived its own death", and there is truth in this. Poland's capital was largely destroyed during the Second World War, and its reconstruction was an exceptional urban development process. Warsaw is a combination of elegant buildings from Saxon times, architecture from between the World Wars, socialist blocks, and modern buildings. Walking through the streets of Warsaw's Wola district, one can see this diversity at a glance. Modern glass office buildings stand next to pre-war automotive garages, and concrete block buildings touch elegant older houses, which show the signs of time's decay. Some call it a spatial mess, while others see in it the residents' determination. Both views are right because that's how Warsaw is. Maybe not the most beautiful, but strong and determined. Nothing reflects the city's character more than its diverse buildings. 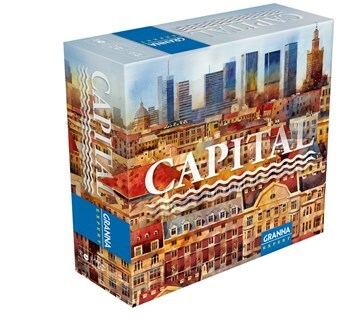 In Capital, players jointly build Warsaw over six epochs, from when Warsaw first became the capital at the end of the 16th century through modern times. Each player creates their own district of the city. At the end of each of the six epochs, districts give income and victory points to their owners. After six rounds, whoever has the most points wins. Discard their tile to the box and take three coins from the bank. Pay the tile's cost in coins and build the tile in their district. Instead of placing a tile on an empty space, a player may choose to build on top of an existing tile. Simply place the new tile directly onto an existing tile, covering it completely. As a result, the new tile's price is reduced by the price of the older tile that it covers. A player's district can never be larger than a 3�4 or 4�3 rectangle of tiles. Each city tile is divided into four quarters, and each quarter has its own type of building, so a tile can have 1-4 different kinds of buildings. Public buildings and milestones are always separate individual areas, even if they are adjacent to each other. They also occupy an entire tile. During the income phase, milestones are placed, and players receive coins and victory points.